Stonington … the epitome of a working Maine harbor. Early morning fog drifts over the islands, creating an ethereal view for anyone fortunate enough to be paying attention as they drive downhill into town. Fishing boats leave the harbor at first light, returning midday with the fresh catch. 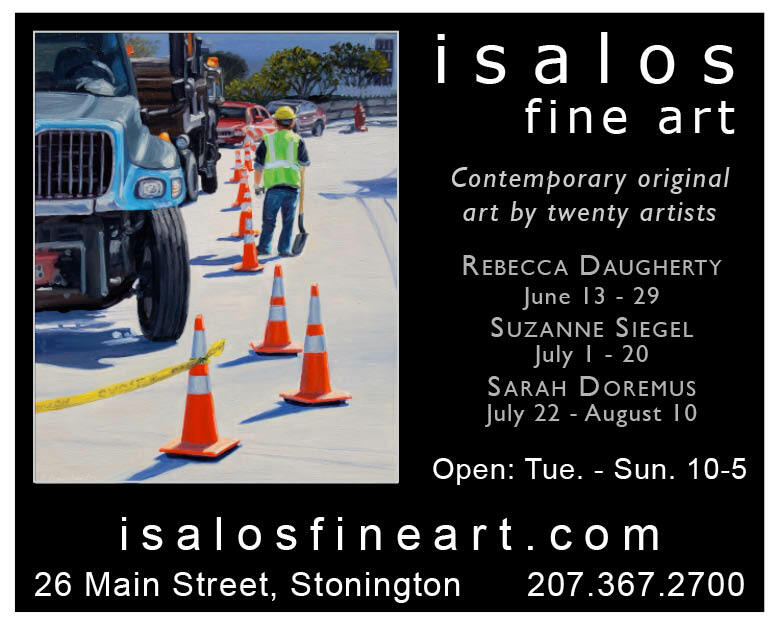 Stonington is home to many fine galleries. Just past Lily’s House (formerly Lily’s Café), watch for Alice’s Art studio on your right, offering her unique, found object folk art. Moving on, as you approach town on Route 15, watch for the sign for Anne-Claude Cotty’s Gallery and Workshops on your left. A talented book artist and pinhole photographer, Anne-Claude is introducing her beautiful brooches of silver and other precious metals that incorporate her hand-colored pinhole photographs. She also offers workshops for young and old(er) alike. Just beyond, you will see Geoffrey Warner’s Studio on your left. Geoff, a fine cabinet and furniture maker, showcases his own work, as well as that of a few other gifted artists. One of his most popular creations is the Owl Chair – available to purchase or you can take a workshop to assemble your own. As you continue downhill, take a right onto North Seabreeze Avenue and stop in where Lorraine Lans shows her own work from her studio. Back on Route 15 (Main Street) and continuing downhill, we come to Waters Edge Wine Shop, offering Bette’s delicious bagels and baked goods, great lunches, as well as fine wines and olive oils, gifts, plus an upstairs gallery. We hear they are reconfiguring the space to focus on dining. Our next stop is the Hoy Gallery. The gallery, located in a large white barn, is a great place to stop and enjoy Jill Hoy’s vibrant landscapes of the coast of Maine. Further downhill, we come to the miniature village, located next to 44 North Coffee/Café (see box below). These miniature houses are on display all summer; each fall, island families take a house home and care for it over the winter, making any necessary repairs before it is returned to the village in the spring. Where can I get an ice cream cone? Stonington Ice Cream Company’s shop, between gWatson Gallery and the library, is hard to miss. Owner Ron Watson has a recipe for one of the best lobster rolls around – but don’t wait, they sell out fast! You can sit on their little deck, or enjoy your cone as you walk along the sidewalk. Across the street, the Granite Museum offers a fascinating look into the island’s granite quarrying history. For example, did you know that granite from Deer Isle was used in Rockefeller Center? As we continue our walk, there’s Prints and Reprints. Offering a variety of old books and prints, this little shop is a fun place to browse. 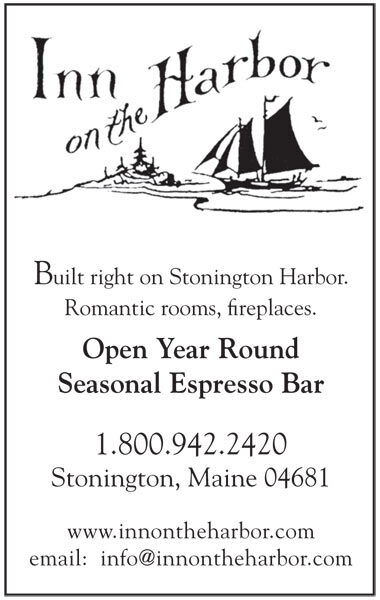 If you need a little pick-me-up, stop into the Inn on The Harbor for an espresso or cappuccino. And don’t forget 44 North Coffee Café for some great Deer Isle-roasted coffee. Located on the waterfront, Aragosta will be offering dinner of superb farm-to-table fare overlooking the harbor, as well as beer and burgers, fish and chips, and tapas on the deck this summer. While you’re busy wandering in and out of all these shops and galleries, don’t forget to look out on the harbor! Constantly changing, it really is one of the most beautiful harbors on the coast. Right next door, the Dry Dock offers wonderful gifts, jewelry, clothing, cards, and pottery from Maine artists. The Opera House continues to provide us with another great roster of films and live performances. This year, their new lobby/concession area will be open after a winter of construction. Continuing on West Main Street, we come to Marlinspike Chandlery on the water side, featuring artistic nautical weaving and rope work for everything from pets to boats. Meanwhile, further along West Main, we walk down towards the water to Dockside, offering all sorts of nautical gifts, magazines, cards, and books. Next? Make sure to drive out Airport Road and visit Siri Beckman Studio on the right across from the airport. Siri’s paintings and woodcuts are just spectacular. Check out Art by Katy, located on Weedfield Road off Rte. 15A on the way to Burnt Cove. After last year’s hiatus, Katy Allgeyer is painting again. Drop by the Art By Katy studio gallery to say hi and take a peek at some new work. On Main Street, you can find Aragosta – on the water side, with their beautiful outdoor dining deck and farm-to-table menu. Rumor at press time was that Aragosta would be offering a fixed menu and seating for dinner this summer. For traditional seafood fare, including lobster and local oysters, stop in at Fisherman’s Friend. They also have an outdoor dining deck overlooking Stonington’s busy working harbor. Harbor Café serves excellent seafood, burgers, etc. And for the early birds, Harbor Café opens really early for breakfast seven days a week. For groceries, there’s the Harborview Store at Fisherman’s Friend. Driving, head to Burnt Cove Market and V&S Variety, out of town on Route 15A, for groceries and everything from soup to nuts to fabrics and hardware. Want to cook your own lobster? Stop in at the Stonington Lobster Co-Op, located just outside of town on Indian Point Road. You can walk down on the dock and pick your lobsters from the day’s fresh catch. If you don’t know how to cook ’em, they will tell you. If you’re looking for fresh, locally harvested fish, lobster, and crabmeat, stop at Coldwater Seafood on Route 15 at the corner of Cemetery Road. This brand new, locally-owned business also will offer fresh clams dug daily, and at least four or five varieties of smoked mussels always available. Live lobsters can be bought and taken home, or steamed right there. Stop in and say you read about them in Arts Guide!